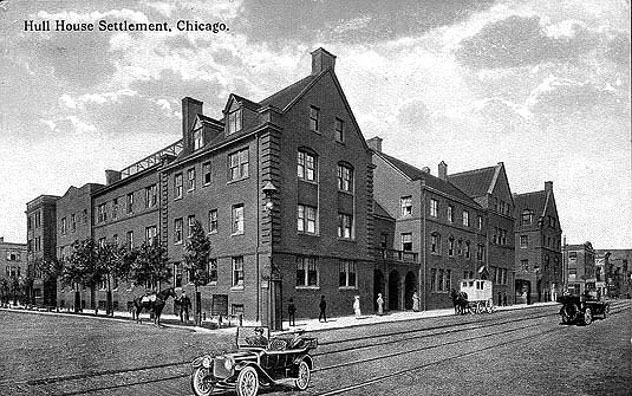 While Upton Sinclair was researching The Jungle, the muckraking 1906 novel that exposed in grisly detail the dangers of the Chicago stockyards at the turn of the last century, he often stopped on Halsted Street to eat dinner in the Residents Dining Room at Hull House, the pioneering settlement house on Chicago’s near west side. Gertrude Stein dined there as well, and WEB DuBois, and Ida B. Wells – and so did hundreds of impoverished recent arrivals from Italy, Greece, Poland, Lithuania, and beyond. Driven to improve the immigrants’ chances at a creating a better life in Chicago, Hull House founder Jane Addams and her fellow crusaders agitated against child labor and for safe housing and sanitary working conditions, and provided a social outlet for all comers. 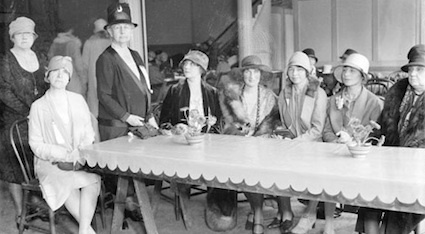 Hull House volunteers offered classes in literature and art; presented lectures and plays; served dinner and staged dances. And when they realized industrial workers nearby had nowhere to get a hot, healthy lunch, they brought the food to the factories – trucking over vats of soup from the Hull House kitchen and offering a bowl, plus a piece of bread and a cup of coffee, for just five cents. 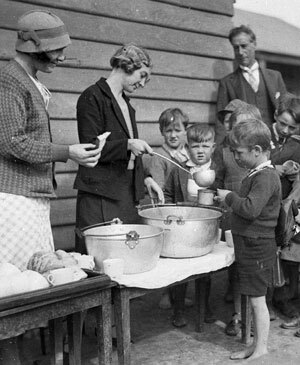 They could have just started a soup kitchen, Lisa Lee — the executive director of what’s now the Jane Addams Hull-House Museum on the campus of the University of Illinois at Chicago — told me, but Hull House was never a charity. “They expected people to donate something in return, whether it was their cultural capital, their social capital, or just the five cents. It was not a place where they were giving handouts. 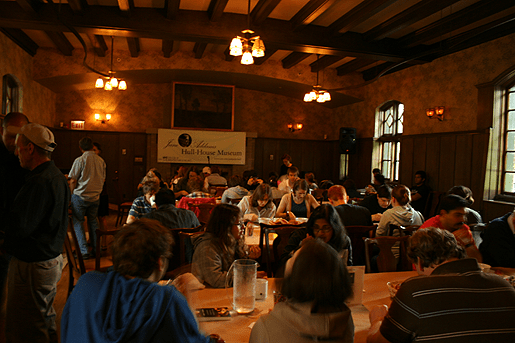 Inspired in equal parts by Hull House’s legacy of outreach and by Slow Food guru Carlo Petrini’s dictum that engaged citizens should be “co-producers” of the food they eat, the museum’s Re-Thinking Soup program is, on it’s face, just that: a free lunch of soup — and bread — served every Tuesday in the historic Hull House dining room. But there’s more on the menu than just split peas. 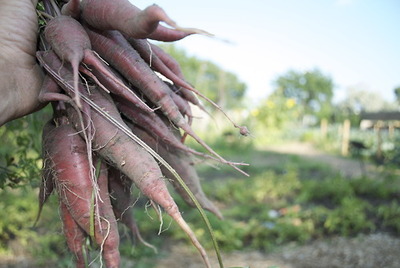 Each week Re-Thinking Soup also features programming designed to spark conversations about food, sustainability, nutrition, politics, and community. 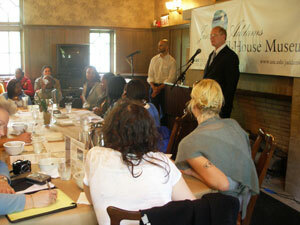 Speakers have included farmers and foodies; academics and activists. One week there might be a film on water preservation; another a beekeeper speaking on colony collapse distorder. On a raw day earlier this month, it was standing-room only for Mari Gallagher‘s presentation on food deserts – the popular (and somewhat controversial) term used to describe underresourced neighborhoods whose primary food sources tend toward convenience stores and fast food outlets. The long refectory tables were covered with brown butcher paper and set with pertinent reading matter, like Joan Dye Gussow’s This Organic Life and Marion Nestle’s What to Eat. Some lunchers, opting to take their carrot-ginger soup sans PowerPoint, carried their bowls outside and dined al fresco along the walkway connecting the dining hall to the Hull House Museum. Re-Thinking Soup is the collective brainstorm of Lane, Lisa Lee, and another professional cook, Sam Kass. Kass turned the program over to Lane in 2009 when he moved to Washington DC to serve as the Obama family’s personal chef (a job he’d held for a while) and the administration’s Senior Policy Adviser for Healthy Food Initiatives. He’s famous now, the face of Michelle Obama’s White House vegetable garden and her campaign for healthy food for kids, but in the early 2000s Kass and Lane worked together at Blackbird, Paul Kahan’s pioneering fine-dining restaurant on Chicago’s Randolph Street restaurant row, not so far from Hull-House as the crow flies, but culturally an ocean away. Lane, Kass, and Lee dug into the history of the settlement house and, specifically, its dining room, looking for ways to link food to Hull-House’s mission of education and social justice . What they came up with, was soup. Nowadays Lane is in charge of programming. Her sister Jess is the Hull-House chef, and handles the weekly soup, whose ingredients are often dictated by the harvest at the Hull House farm a block away. The farm, run by Ryan Beck, grows garlic, kale, tomatoes, cauliflower, and more – but it’s primarily an educational enterprise, rather than a true production farm. “We use it as a teaching tool for telling the story of Jane Addams,” says Lane, citing a well-known bit of Addams lore, in which the well-bred reformer delighted in her first encounter with a strange bulb called garlic, thanks to an Italian neighbor who introduced her to spaghetti and ragu. 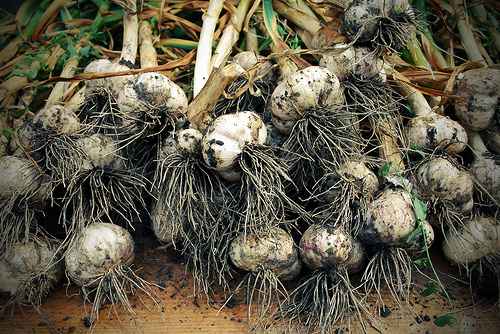 Now the Hull House farm grows 6,000 heads of garlic a year, and it’s used in the base of every soup. Lane and Lee took Re-Thinking Soup to 2008’s Slow Food Nation in San Francisco, and to a museum conference in England in 2010, where they made 50 gallons of soup in one of Jaime Oliver’s kitchens and trucked it to the Victoria and Albert Museum as part of a talk about how museums can foster social change. Now the V&A and the Royal Academy of Arts are considering their own soup-based programs, as is the Lower East Side Tenement Museum in New York. © 2011 Soup and Bread. All Rights Reserved.